Contact us directly if you want to verify we haven't swapped out or upgraded any particular machines. 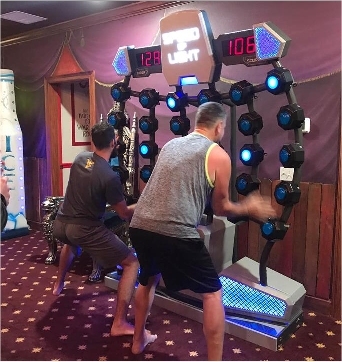 Race against the clock and/or your opponent to hit the most lights for points! 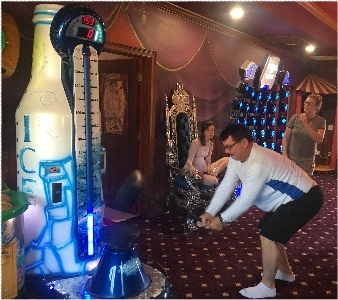 The classic carnival midway test of brute strength! A sure "HIT" : Get it ? Choose your onscreen opponent and then see if you can beat them over 3 rounds! Every group seems to have a champion. Who will yours be? 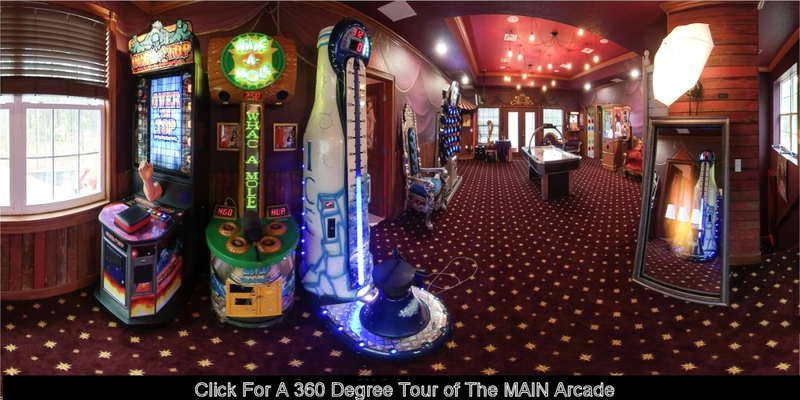 Play on an authentic Jersey shore boardwalk machine overlooking the Billiard Swimming Pool! "Henri" will talk, flirt, and give you a card with your fortune printed on it! Find out just how passionate YOU are! Play the classic and find out what's in the briefcase! A high-tech touch screen mirror that doubles as an elaborate photo booth and plays games too! Share your Mirror Me photos on social media! Featuring approximately 60 classics from the era that first made video games so popular. A wall:-mounted arcade machine featuring over 1,000 games ranging from old school 80's and 90's arcade legends to home versions from Sega and other console manufacturers. Choose from more than two dozen old school game cartridges and play them on either of these classic consoles that helped pioneer home video gaming! Play your favorite modern home video games in the Jumanji 2.0 Theater or in the X:Box/Playstation 20th century video games bedroom! The Great Escape Parkside's Availability! These Are Just SOME Of Our Incredible Amenities! Go inside of a giant zorb ball and roll yourself into a set of soft bowling pins! You can even keep score! Read more..
"Shoot Pool" - 8 Ball Swim! The billiard table "pool pool" features a lazy river, fast waterslide, water canon, and "chalk" hot tub! Read more..
Gamers - Stay A FORTNIGHT! Our X-Box/PS room includes 6 bedside flat screens connected to multiple video game consoles! Read more..
Everyone from the ages of 1-116 will find multiple things they LOVE about Great Escape Parkside! Read more.. Yes, That's A Laser Maze!! Duck under and jump over high-tech lasers as you race against time to get the lowest score possible! 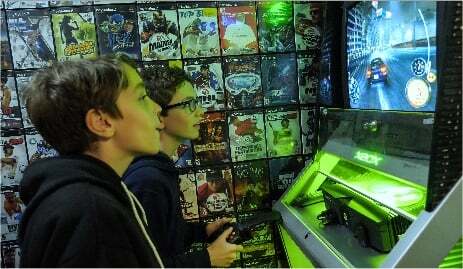 Read more..
Sleep in an immersive 360 pac-maze and play classic stand-up arcade games as well as Atari & Coleco classics! Read more.. Perform On Our Karaoke Stage! Choose from among millions of song titles and many colorful costume props too! Come rock our stage! Read more.. In The Twister Bedroom, the bed folds into the wall so you can play a 360 degree version of the classic! 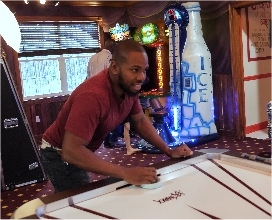 Read more..
Air Hockey! Speed of Light! Whack-a-Mole! Classic Standup Machines...You'll find a ton of arcade machines here! Read more.. The Jumanji theater is an immersive 360 degree experience in a high-end, state-of-the-ART cinema! Read more.. Shoot Pool & The Pool Pool! Our billiard-table swimming pool has a cue stick water cannon, lazy river, fast waterslide, AND a pool table! Read more..
Only steps from our gaming amenities, you'll find 10 gorgeous, hammock-studded acres of tranquility. Read more..
You'll have 60 minutes to crack puzzles and solve a murder mystery in the spirit of the classic board game! Read more.. Enjoy life-sized chess, 6 foot tall Scrabble, Giant Mencala, Wall-Mounted Connect Four, and so many others! Read more.. The Never Be BORED Game! Roll giant dice and battle your way around this unique outdoor board in head-to-head game challenges! 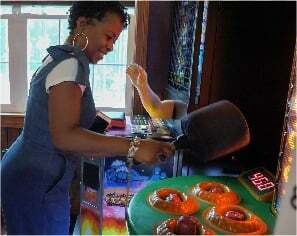 Read more..
Be IN A Whack-a-Mole Game! Up to 6 "moles" compete to grab & store as many prize balls as they can...without getting "whacked!" Read more.. Try to score a bullseye by kicking velcro soccer balls at this enormous inflatable target! Read more..
Form two teams and go head-to-head to be the first to escape this unique game while avoiding espionage! Read more.. Copyright . All rights reserved. The Great Escape Parkside is a Private 10 Acre, 15 Bedroom Estate/Vacation Rental Just Outside Of Orlando, Florida. We have no affiliation with the makers of any games that we've used to artistically decorate our rooms. First class, SIX star service is provided to all guests during their stay. The owners reserve the right to refuse to book any guest who gives them reason to believe that they will be potentially destructive to the property. Bookings are on a first come, first serve basis. The Great Escape is in a secure, gated location with an excellent reputation. However, neither the owner, nor Orlando Area Luxury Rentals, LLC are responsible for any damage to a guest's personal property nor for any injury that occurs during any guest's stay. Full terms of booking can be viewed in our standard rental agreement. If you have ANY questions, please click here to let us know or call 1:352:978:8730.